Jailbreaking opens up a whole world of new possibilities for your iOS devices. There are literally thousands of Cydia tweaks that can customize every aspect of your device to your liking! Today we are going to be taking a look at a tweak that, while not bountiful in functionality, will still please a select group of people who find the sound and vibration effect that happens after you plug your device into your computer via USB annoying. 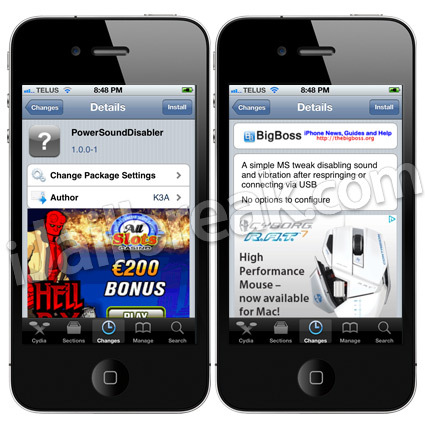 This Cydia tweak is called PowerSoundDisabler and it will actually disable the sound and vibration that takes place after plugging your device into your computer through USB or respringing it. I’ve been waiting for this tweak for YEARS!!!! !